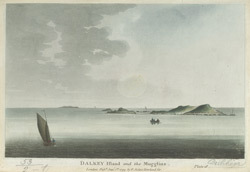 View of Dalkey Island. The island is the largest of a group of rocky islets situated in Dublin Bay and is 300 metres off the south coast of Ireland. There is evidence that the island was inhabited as early as the 4th millennium BC. There are also the remains of a 9th century church and a promontory fort at the north end of the island. In the early 19th century a Martello Tower and gun battery were built as part of coastal defences against a Napoleonic invasion.